I have been having fun on 6m every summer since the late 60's. Without doubt, this summer's Sporadic-E (Es) season is the worst one I have experienced in terms of domestic (North America) openings. This summer was almost a carbon-copy of last year's summer Es season. As I mentioned in an earlier blog, unless this is some form of short term or cyclical anomaly, the fundamental nature of Sporadic-E openings appears to be undergoing some type of change. Missing-in-action were the numerous day-long intense openings to California as well as the grand openings to the eastern states (FN grids) and Canada ... all guaranteed openings every summer. These openings would often last well into the late night hours and even overnight, picking up the next day where they left off. This is the second summer in a row where no Es MUF's into the 2m band were experienced, with this year having seen nothing even as high as the 88-108MHz FM band. Maybe I missed them if they occurred, but I don't think so. In terms of non-domestic openings, the band continues to evolve, as it seems that a higher percentage of hours with very long skip continues to rise. As poor as this year has been domestically, CW contacts were completed with Germany, Ireland, England, Japan, France, Canary Islands, Balearic Island, Venezuela, Cuba, Puerto Rico, and the Cayman Islands. A short and exceptionally rare opening to Africa, allowed an 'almost QSO' with CN8KD in Morocco, as he had one letter of my call incorrect when he quickly faded away ... pretty exciting even for a 'busted' QSO on 6m, in the middle of summer. Whether this very long propagation is just multi-hop traditional Es or something entirely different is still up for debate, as often there are no indicators (beacons or other mid-point signals) indicating that the band is even open. Many, including myself, believe this is some form of chordal hop or interlayer ducting, involving the E-layer alone or perhaps even the bottom of the F layer. Signals strengths can reach 599 levels and almost without fail, have extremely small footprints, with stations just a few miles away hearing nothing at all. When these openings occur between western North America and Europe, they can be very exciting, as the footprint on the European end often sprays around like a stray garden hose, popping up in a different country with each passing minute. Openings are often fast and furious and always heart-pounding! Perhaps there is still some magic yet to occur but the 'normal' season (or what used to be normal) is drawing to a close as August nears. 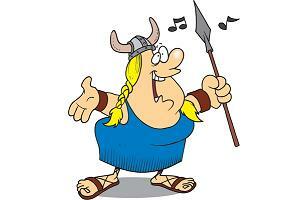 The fat-lady is warming up her voice behind the curtain and will soon be singing once again. But something else is changing on 6m besides the propagation and that is the huge growth of the JT65 weak signal digital mode. As the season draws slowly down, I still see long-time dedicated CW operators going up the band to dip their toes for the first time on this alternate mode. 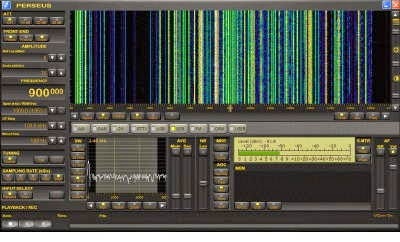 I have used it fairly often to work stations when the CW / SSB end of the band appears to be dead. The maps shown below, grabbed just four days ago, illustrate what I have been seeing. The amount of JT65 activity is striking, compared to the traditional CW/SSB modes, both shown for the same one hour period. I could assume that the several extra db of weak-signal sensitivity is the reason for the disparity seen from one mode to the other but there may be other factors coming into play. Once the band really opens however, the weak-signal sensitivity of JT65 soon looses its previous advantage and the JT65 segment of the band can get pretty clobbered, with numerous signals on top of each other, all competing for their ~200Hz slice of the spectrum. As well, a JT65 QSO is slow ... a minimum of four minutes. Taking four minutes to exchange calls, reports and 'rogers' on a wide open band with strong signals, makes little sense. Perhaps the majority of 6m JT65 operators are new amateurs with a codeless licence or are operating in antenna-restricted communities. Whatever the reason, the numbers are growing and traditional operating patterns are changing. Who knows what next summer will bring! "BTW one of the best and most simple noise reductions is to lower the volume." "BTW, lower the volume to reduce noise ... ?? That was a joke, right ??" me....not sure why this works as well as it does." age, but I am not sure about that. the volume for weak signals, but this is often contra productive. PC, that is aurally quiet. "No it's not a joke and it's not the RF Gain. It's one of the capabilities of the human ear. Of course qrm can be limited and reduced but noise is difficult. What you often see is that with all those noise reduction things is that the volume drops. Make an audio recording of a part with and without a (white) noise limiter switched on. Open it into an audio editor and you will see that the amplitude of the part where the noise reduction is on is lower. Now amplify that part to the same level as where the limiter is not active and play it back. You will be astonished how little the difference is. It's probably also a thing that can differ from person to person but I've never seen tools that can make an unreadable signal readable. Most of the time they sound just different, not better." Likely there is a ton of data showing how our ear / brain link deals with noise or tones buried in noise. 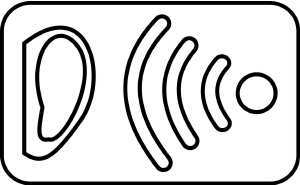 With audio levels set to anything above bare minimum, I think it's very easy for your brain to react mainly to the noise and not to the tone. Reducing this level possibly puts the two back on even levels ... even though there really has been no change in signal-to-noise ratio. When trying to copy very weak, difficult signals, I've always found that turning audio levels down to bare minimums helps me personally. As Roelof mentioned, the entire environment must be dead quiet as well so that there are no outside distractions. Even the sounds of the headphone cord, brushing against clothing or the table top, can make the difference between copy and no copy. Decades of copying very weak ndb CW idents buried in the noise as well as spending several years on 2m CW moonbounce, has taught me that my ear-brain connection works best when audio inputs are very, very low. As an interesting aside, my years of copying weak CW tones, has shown itself in other ways as well. Before retirement as a high school tech ed teacher, staff were required to have their hearing checked annually, as part of the medical plan's requirement. 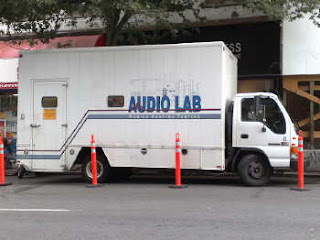 Each year the mobile audio lab would roll-up for the tests. I would always make sure to sit perfectly still, with no headphone cord wires brushing against my clothing. The tones varied in frequency and intensity and were often extremely weak, not unlike the weak echoes I was used to copying from the lunar surface. The reaction from the examiner was always the same, every year ... complete astonishment when checking the results and usually a comment that I had the hearing of a teenager! Thankfully my hearing, which I've always been careful to protect, remains exceptionally good, for which I am truly grateful ... so often this is a genetic thing and there is little one can do about controlling hearing-loss as one ages. I shudder anytime I see a young person with headphones or earbuds firmly in place and with the music volume cranked up to unbelievably high levels. Sadly, many of them will likely pay the price for this later in life as such hammering-away at the delicate auditory mechanism has a cumulative rather than a short-term effect. So ... the next time you find yourself trying to copy that ultra-weak signal just riding along in the noise, try turning the audio way, way down. Take a deep breath and listen to the tone, not the noise. If you ask me, the best signal filter is still the one between our ears. I've been exchanging e-mails lately with Roger, VK4YB, in Queensland, Australia. Roger is located about 30 miles from the ocean and has been the only VK signal that I have been able to hear on 630m WSPR mode. 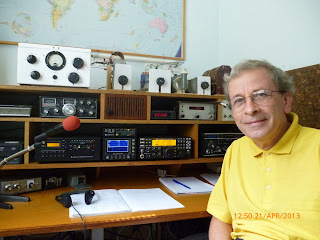 He seems to have the strongest signal out of Australia on 630m with his 90 watts and 120' tree supported wire vertical. John, VE7BDQ, has been heard twice down under with his modest station running at the allowable 5W EIRP limit, being reported in the fall of 2015 and again this spring. As well, John has heard Roger, the only signal from VK that either of us has copied. The path from my end is difficult as I am on the east side of Mayne Island and in Roger's direction, about one mile from a 600' hill directly in line with VK. Any RF heading Roger's way will need to leave here at a fairly high angle, which is likely the case anyway considering the low and short (in terms of wavelength) inverted-L antenna. The path profile from here to the open Pacific Ocean is shown below, with my end being on the right edge, just behind those two hills. 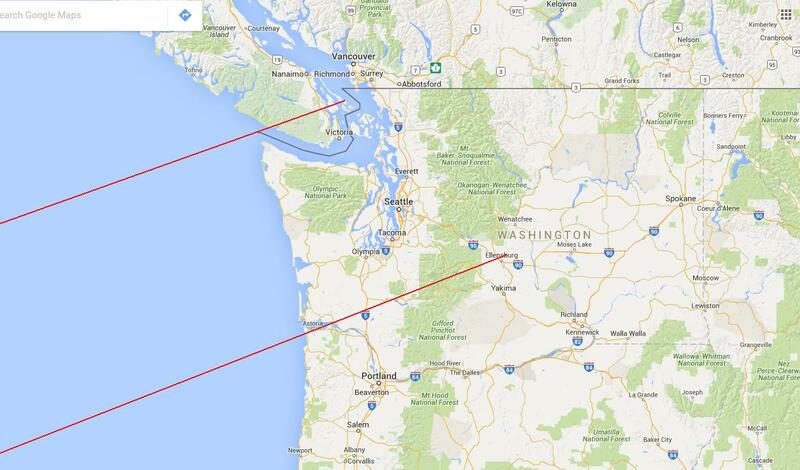 The rest of the obstructions are on Saltspring Island and then Vancouver Island, before hitting open water. 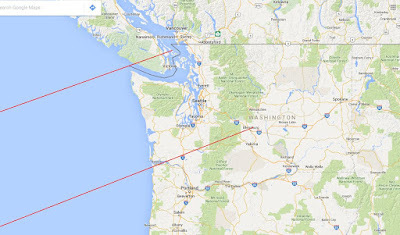 The most consistent west coast signal to reach down under is from Larry, W7IUV, in Washington state, operating experimentally as WH2XGP. Larry's path is a little more forgiving although his inland location certainly doesn't help. His first obstacle is about 10 miles away and about 2,000' higher. I would guess that his signal is well above that before reaching those mountains and the remaining higher Cascade peaks would not interfere. The path from John, VE7BDQ, already heard in VK, is also easier than from here. Not far from the water, John has a pretty clear shot across Georgia Strait, giving his signal lots of time to gain altitude and clear those pesky Vancouver Island peaks. VE7CNF's (Toby) path profile is similar to mine in that he is confronted very early with a hill to clear. Once over that his signal should be well above the mountains. VA7MM's (Mark) path profile looks a little better than Toby's as there is a little more distance for his signal to gain altitude before passing over Vancouver Island. Mark was also able to detect VK4YB's WSPR signal earlier this spring and is looking forward to the fall tests with Roger. VE7CA's (Markus) path profile is probably the best of all of us on the west coast as he is located high up on the hills to the north of Vancouver along with an open shot to the ocean. I think my only advantage here is my quiet receiving location as it's going to take some brute-force to get over those nearby peaks. Like many of those operating from the suburbs, higher noise levels really take their toll on weak-signal reception and that will be the biggest obstacle for those operators in the city. Twenty years ago, this would not have been nearly such a problem! 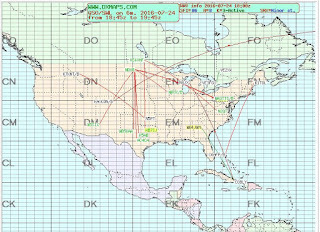 Shown above is Roger's path to the Pacific and illustrates one of the reasons why he has the best signal into North America on MF! Although 30 miles from the ocean, there are no obstructions, yet ... coming soon is a 120' cell tower, directly in line with North America and less than 1000' from his antenna. Hopefully it won't cause any problems other than being a dreadful eyesore. 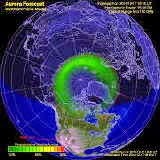 As the solar activity slowly abates (but not this week! 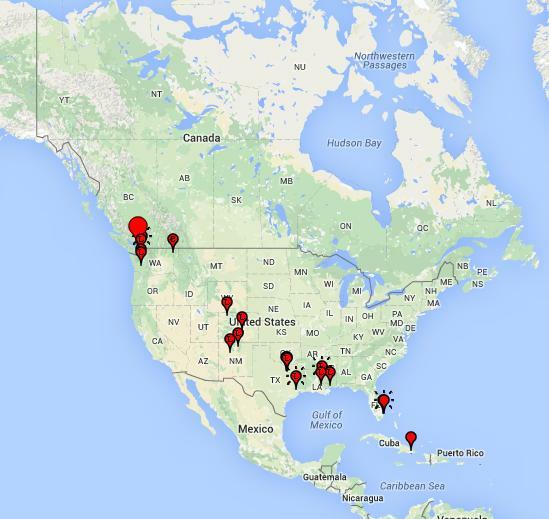 ), propagation on 630m will slowly get better and better ... hopefully along with increased levels of Canadians transmitting on the band, and lots of stations in the USA. It is hoped that our enthusiastic neighbours to the south aren't too far away from getting the band fairly soon. Better get those soldering irons warmed-up so you are all ready to go! This past week, most of my 6m time has been spent monitoring or working JT65A mode stations, up the band a bit from my usual hangout around 50.100MHz. My main interest has always been CW but for some reason, and much to my surprise, the small sliver of JT spectrum space above 50.276MHz seems to be much 'busier' than the lower end of the band! On several occasions this week, I have heard or worked dozens of others on JT mode while the bottom end of the band appears void of signals. Thursday morning was a good example, with several contacts down into the southeastern 'EM' grids on JT mode while seeing no reports of similar contacts being made on CW or SSB from my region. This summer, there appears to be much more interest in 6m JT65 than ever before, as I see many familiar CW operators up the band on digital. There is no doubt that JT65's ability to dig deep into the atmospheric band noise and decode signals too weak to be heard on CW, provides an advantage when conditions are marginal. Perhaps this alone explains why I see such a difference between the two segments of the band. 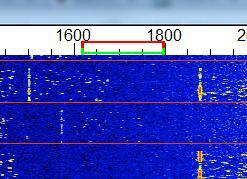 This is when JT65 really shines as it is primarily a weak-signal mode. When the band really opens up however, things are different ... things can get messy pretty fast when the JT65 band fills-up with S9+ signals! Under these conditions, moving well away from the crowd is often better than trying to fight overlapping signals, often made worse by S9++ signals in your own grid, transmitting on the opposite sequence. In this respect, the JT65 segment is like a wider version of the 50.125MHz calling frequency ... the one spot in the conventional mode section of the band where anything goes ... the wild west of 6m. During one particularly noteworthy period of no action in the lower part of the band, JT65 signals were either copied or exchanged with CO8, V31, TG9, KP4 and XE. Many of these signals were heard for several hours, making the difference even more striking. Perhaps having all of the JT signals crammed into a 2kHz sliver just makes it seem busier but the mode is certainly gaining steam. Now actually working guys on JT65 is akin to watching paint dry, as its weak-signal sensitivity comes at the expense of time ... the same information that could be sent on CW in 10 seconds, requires a full minute. A complete QSO takes a minimum of four minutes and the 13-character message buffer does not exactly encourage much conversation, other than calls, signal reports, grid squares and 'RRs'. All the same, calling CQ and waiting for the telltale signs of a reply to appear on the scrolling waterfall is somewhat mesmerizing, not unlike an addictive video game of sorts ... just one more CQ! Will I abandon the CW end of the band? Never ... but having another mode to play with on the magic band is proving to be much more interesting than listening to the usual din of white noise, waiting for the band to 'really' open. You can read more about JT65 and download the free software, WSJT-X, here. 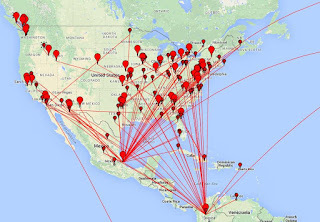 For the past few weeks, Ron, NI7J in Phoenix, has been activating his experimental station, WH2XND, in the LF band ... on 75.550kHz (WSPR), where he is licenced to operate. Last night I decided to put my nightly 630m WSPR beacon on hold and have a listen for Ron's signal using my 10' x 20' loop. 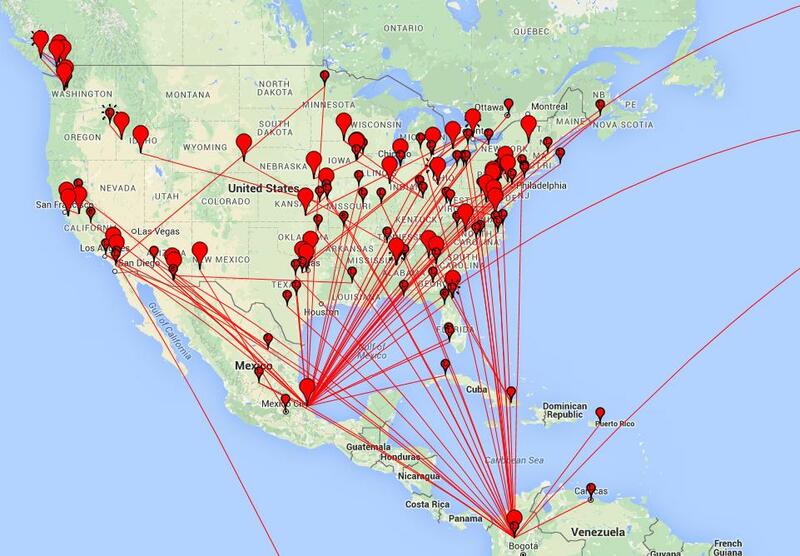 Ron's main experimental operating has been on 630m and 2200m WSPR mode but his recent activity on 75kHz has sparked a lot of interest among dedicated summertime listeners. WH2XND is licenced for 10W ERP on 75kHz, not a number that's easy to muster considering the poor antenna efficiency produced by typical amateur installations ... however, judging from Ron's coils, his installation looks far from 'typical'! Ron's signal is being well heard, even up in Alaska, in spite of the noisy summer conditions and it will be interesting to see how well it propagates once we move into the fall and quieter winter nights. 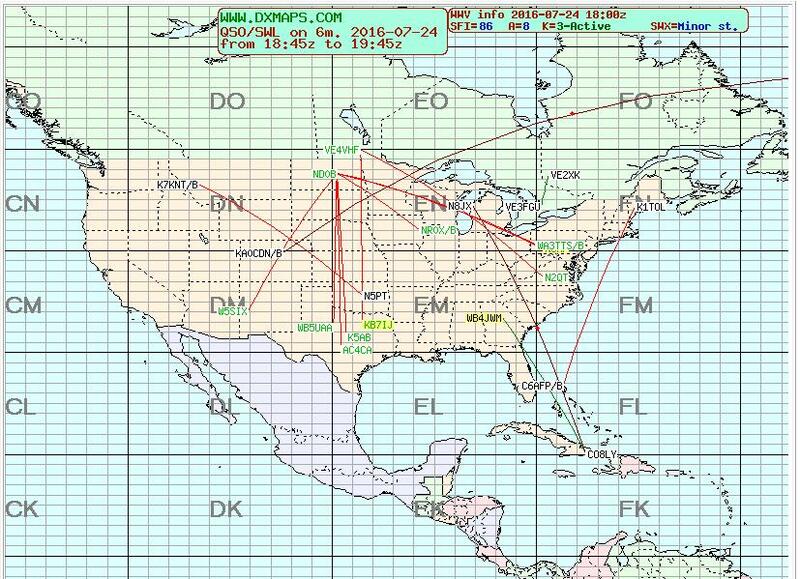 The big loop seemed to do well with Ron's signal last night, resulting in 55 decodes starting at around 2300 local time and continuing to sunrise. His signal peaked here (shown in blue above) about an hour before sunrise, with almost a dozen decodes in the -18 to -20 region ... not far from audible CW levels which will probably be seen in winter. It was interesting to note as well, that in several transmitting sequences, Ron's signal was stronger in Alaska than it was here and in Washington state ... just the opposite of what one might expect. In the past, I have had good results on 75kHz with Dex (W4DEX), when listening for his QRSS CW signal, using my normal inverted -L with a 2.5mH RFC inserted in series with the antenna's normal loading coil. If you can give a listen for Ron's WSPR signal and send him a report ... or better yet, upload your spots to the WSPRnet site, he would be very appreciative. For listening, set your receive frequency to .074kHz in the USB mode. The software will take care of the rest. You can upload 'LF' spots with your software by setting the '.074' receive frequency in the program's normal frequency or band window. Is Your Miniwhip Too High? 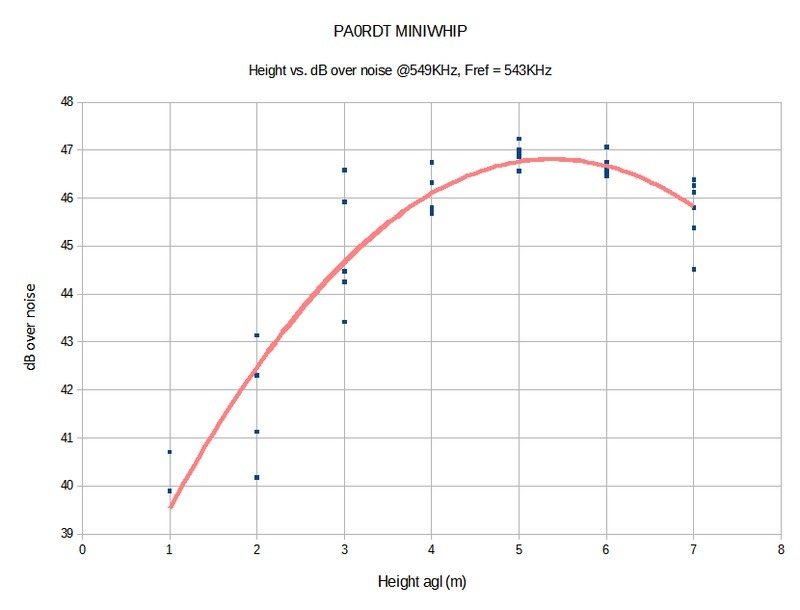 A recent posting to the 'ndblist group' described an interesting experiment by Dirk Claessens regarding the signal-to-noise ratio (SNR) versus height of his PAØRDT active whip. Dirk's tests were posted on the 'Navtex DXing Group' where some further interesting discussion seemed to confirm his findings. Here is what Dirk discovered, backed-up with his graph data, clearly pointing to the 'ideal height' at his location ... and probably yours as well. You may recall that to get rid of a source of QRM, my whip is now hanging from a rope-and-pulley system, about 5 .5 mtr from the house, at a height of 7 meter agl. 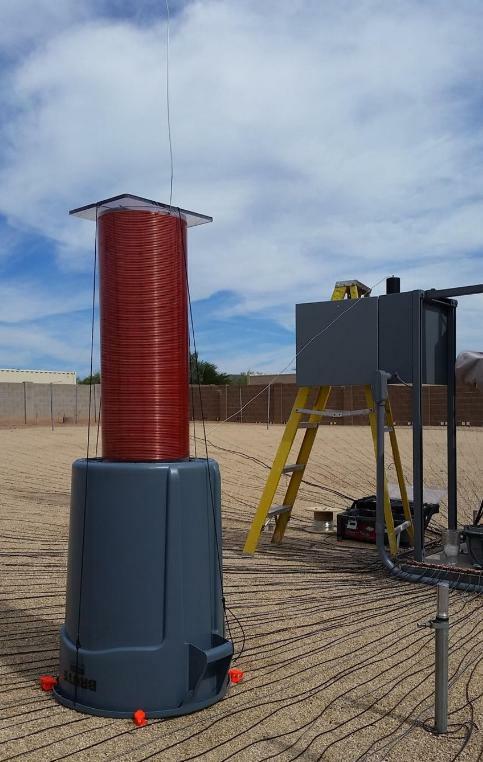 As the height of the whip can easily be changed, this is an ideal situation to test the behaviour of the whip wrt noise levels, optimal height etc.. I had done this test before some 4 years ago, but not very precise. Time to do it again, and documenting it. What I also wanted to check, is if there were any noise sources of the own house possibly reaching the whip. The Perseus was tuned to 549 KHz Deutschlandfunk Nordkirchen, the station closest to 518. 2 markers were set, one to the signal, and a reference marker in a quiet spot nearby on 543 KHz, to get a reading for the noise floor. The whip was then lowered in "1 meter each minute" steps, readings were taken and written to the marker file. First the absolute values were plotted. 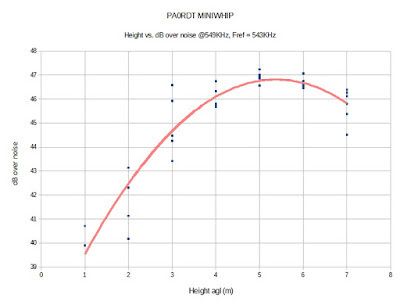 Note that: blue = noise floor, red = signal, and that the left and right axis scales have identical spans of 19dB, but are shifted, in order to get a compact graph. -the noise floor goes up ~8dB, or 8/6 = 1.3 dB/m, almost linearly. -the signal goes up ~14 dB, or 14/6 = 2.3 dB/m, clearly curved and showing a maximum at ~5..7 m.
The continuous lines are polynomic (2nd degree) regression lines. 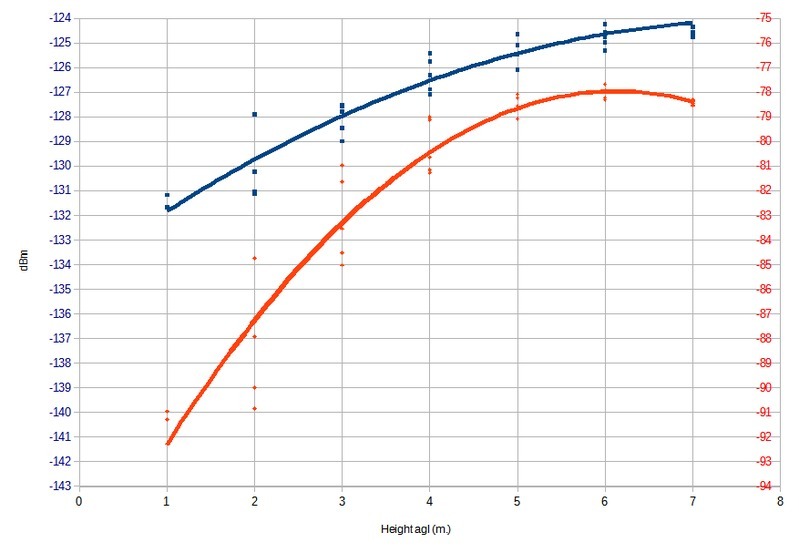 The noise on the measurement values seems to increase with decreasing height. Was this caused by my body standing under the whip, and near to the whip for the lowest measurements?? -Within a narrow 1 dB band, the curve shows a clear optimum in the region of 4..7 m agl, a familiar value often given as optimal by Roelof. -The measurement was performed during the day and thus with ground wave propagation. As the whip is truly omnidirectional, I cannot see a reason why the behaviour would be different at low angle DX signals. - At 5.5 meter from the house, the whip seems to be outside of the "noise bubble"
That's a whopping 15 dB difference! I have also buried the coax ~20cm deep from the grounding point to where it enters the house. 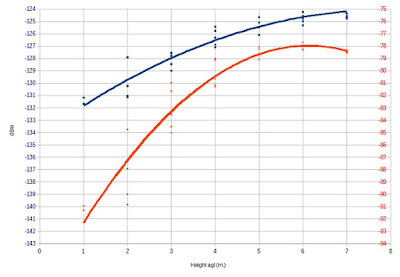 The ideal height was also that recommended by Roelof, PAØRDT, originally and points out that one of antenna-building's most sacred commandments ... "the higher the better", is not always true! I have often recommended this simple antenna for those looking for a very effective yet low-footprint receiving antenna for use on the LF and MF bands. Much more information about Roelof's popular miniwhip may be found in previous blog discussions here. This past weekend saw another of the monthly CLE listening challenges. 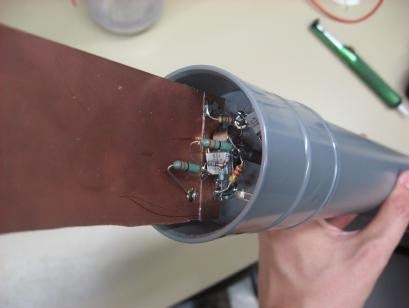 If you are interested in building a 630m system, doing some listening on the high end of the NDB band is a great way to evaluate your station's receiving performance. The frequency range covered for CLE 208 was 400-419.9 KHz where a fair number of North American NDBs' can be found. Beacons at this end of the band also tend to propagate better than those at the lower end near 200KHz. This weekend, typical summertime conditions prevailed, with extremely high levels of thunderstorm / lightning QRN ... propagation itself was not too bad for the middle of summer. As usual, I set up my Perseus SDR for hourly two-minute captures of the allocated spectrum and spent a few hours going over the files during the day. I have yet to purchase and download the latest version of Perseus software but I understand that there are several improvements over the system I am using ... which is excellent for my present needs. Final details can be found at the NDB List Website and worldwide results, for every participant, will be posted there a few days after the event. If you are a member of the NDB list Group, results will also be e-mailed and posted there. 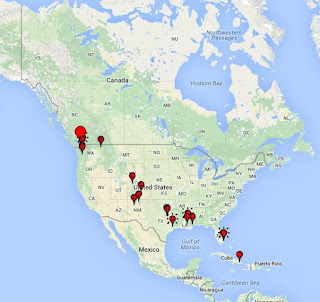 The very active Yahoo NDB list Group a great place to learn more about the 'Art of NDB DXing' or to meet other listeners in your region. There is a lot of good information available there and new members are always very welcome.